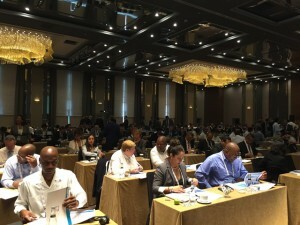 In preparation of the Antalya Summit, the Turkish Presidency G20 Logistics Task Force carried out an advance team visit on 17-18 September 2015 with the participation of G20 countries, international organizations, and invited countries in Antalya, Belek. More than 300 participants from G20 countries and international organizations were accredited for the advance team visit. The G20 Task Force, composed of different committees, briefed the advance teams on the preparations currently underway for the summit. In this respect, the content of the briefing covered various aspects of the summit preparations including; accreditation, protocol, transportation, accommodation, event management, health, media and IT. A separate briefing was held on the security aspect of the forthcoming Antalya summit. In addition to the briefings, a site visit was conducted to the proposed summit venues including; the plenary hall, viewing room, business centre, bilateral rooms, and the official greeting area. The advance teams also visited the International Media Center (IMC) which is planned to host 3000 media members during the summit. Furthermore, the advance teams paid a visit to the main accreditation center which will be located at the premises of BETUYAB (Belek Tourism Investors Association). Following the visits to the IMC and BETUYAB, the advance teams also visited the Antalya International Airport where the arrival and departure scenarios of the leaders were rehearsed. The advance team members were given a brief tour of the aprons and runways. In addition, luggage tags, which will be used during the Summit, were also distributed to advance team representatives to facilitate their arrivals. On the second day of the advance team visit, bilateral meetings were held with country delegations who wished to receive additional information and convey special requests and needs of their leaders and official delegations. In this respect, the Task Force committees carried out bilateral meetings with 28 delegations from G20 countries and international organizations. Another advance team visit will be organised by the Turkish Presidency Logistics Task Force in the first week of November which will, in essence, be the full rehearsal of the Summit.